Carbon nanotubes could be as bad for you as asbestos, a new UK study has shown. Use of the mineral asbestos, which was widely employed in the building and transport industries, has been banned in developed countries for many years after it was shown to cause lung diseases and lead to a form of rare chest wall cancer called mesothelioma. These diseases occur because asbestos particles resemble long, sharp needles. These become embedded in lung tissue and cannot easily be dislodged by the cleaning mechanisms that normally remove dirt and debris from the airways. The persistence of the asbestos particles in the tissue causes repeated bouts of inflammation. This, scientists have long suspected, causes damage to nearby cells, increasing the likelihood of cancer. Now a new study has shown that some forms of carbon nanotubes, which are long, cylindrical molecules with sides that can be just a single carbon atom thick and are used in a range of applications and industries, could pose a threat at least as large as asbestos. Writing in Current Biology, University of Leicester researcher Marion MacFarlane and her colleagues exposed mice to different doses of nanotubes likely to be encountered occupationally, and both long and short nanotube preparations were tested. For comparison, they also exposed a futher group of mice to asbestos particles, again at a level likely to be encountered occupationally by a human. The animals were followed for up to 18 months, and the team studied how the lung and chest-wall tissues in the animals responded to the exposures. In all cases there was a bout of acute inflammation during which the immune system moved in. Subsequently, the short nanotubes were successfully scavenged away by immune cells and the tissue returned to normal. But the longer nanotubes and the asbestos particles persisted, and led to a state of continued, or chronic inflammation. By 18 months, about a third of the animals exposed to the longer nanotubes or asbestos developed tumours resembling human mesothelioma. The findings are alarming because they show that long forms of carbon nanotubes, which are being used in a range of applications from medical devices and sports equipment through to boats and buildings, are potentially capable of causing cancer through the same mechanisms as asbestos. "And the dose we used was more than 10 times lower than the exposure limits imposed by safety guidelines in industry," says MacFarlane. The researchers also used DNA techniques to track how the disease became established in the mice. They found that the gene Cdkn2a, which normally plays an important role in blocking the development of cancer, was under-active in the tissues damaged by the nanotubes in the exposed mice. Critically, the same gene is affected in human cases of mesothelioma triggered by asbestos. "We think that the chronic inflammation causes the production of reactive forms of oxygen, which damage the DNA in the cells of the chest wall," explains MacFarlane. "Initially this turns down the activity of the Cdkn2a gene by an epigenetic mechanism. Later the gene can become mutated, stopping it working completely." The result is that the cells lose a protective brake they can normally use to block cancer formation. This increases the likelihood of a tumour developing. "This study is important on two levels," MacFarlane points out. 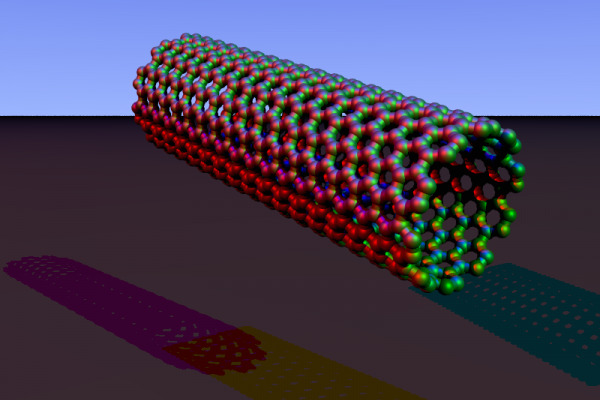 "It's the first direct evidence for a hazard posed by nanotubes. These are manufactured, so now that we know this we can make them 'safe by design'. Second, it fills a big gap in our knowledge of how agents like asbestos cause mesothelioma, and that means it can also highlight possible therapeutic avenues..."